Art and Amy were fantastic! The communication prior to arrival was very helpful; they were equally friendly and helpful once we arrived. We loved our stay here! Weve been staying at another resort for over 30 years, but decided to try something new this year. After walking into the cabin, we wished we had made the switch sooner. The cabin was very clean and well kept, and the view was spectacular. We cant wait to return! We loved our stay at this beautiful cabin. I'm writing this now because i searched through my email to find out which cabin we stayed at for our honeymoon. Cliffside was the cabin and it was perfect. Art and Amy were so good to us and you can't beat the price for the experience. Art went above and beyond to make our stay enjoyable. Highly recommend the property! Will be back! Thanks Art! Art and Amy were friendly and knowledgable about the area and made several great recommendations on where to eat and where to find things in town. Great owners! 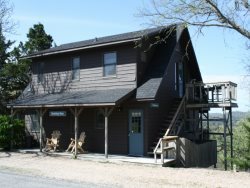 Great cabin and even greater views of the White River valley!! The cabin was clean and very comfortable. Satalite television if you have time to watch as well. Art & Amy were friendly and helpful every time we contacted them. From helping arrange our visit to providing specific pans during our stay, they were a pleasure to work with! We will definitely plan to stay with them again! Art and Amy are awesome and strive to make your stay at White River cabins as pleasurable as it can be. This was our second year to book with Art and Amy, everything from excellent customer service to the gorgeous views over looking the White river make you want to come back again and again. The cabins are up to date,nicely furnished with everything you could possibly need. We had storms to threaten the area during our visit and Art was worried about my Harley sitting out in the open, so he found a sheltered area and suggested I move my bike where it would be safe. The little things mean a lot and even the little things are very important to Art and Amy! We loved everything about White River Cabins! The cabin was clean, the kitchen had everything we needed, the beds were comfortable, and the view was spectacular. The setting was quiet and serene, and we will definitely be repeat customers. Amy and Art are doing a terrific job as the new owners. Thanks for a really amazing experience! You were wonderful & courteous. It was a pleasure meeting you and sharing your cabins. Fantastic view of White River. Cabins are wonderful, fully stocked with everything except the food. We love staying here and the new owners have done a great job making the property a wonderful place to be. Thank you for being a great place to get away & relax. Amy and Art were really friendly and take great care of the place. We had a wonderful time and found the cabin to be a great place to stay. The views are spectacular! We have stayed at the AK White River Cabins for over 10 years now and wouldn't stay anywhere else in Eureka Springs. We love the quiet location and beautiful scenery of the property. The improvements you've made in the rooms and around the property in just the last year are terrific. I'd like to suggest an item for visitor safety. You should check the decks and wooden walk ways for any nails that have worked up above the surface of the wood. I saw a few and worried that if someone walking barefoot in warm weather might catch a foot on one. You might use a nail setter to push the nails below the surface of the wood so they won't come up again. Absolutely amazing...I fell in love with this cliffside cabin the moment I walked through the door. The view was incredible, so peaceful and everything we needed was right at our fingertips. I'm already planning our next stay and this time it will be longer. I did not want to leave. awesome stay! The only place we stay when in Eureka Springs. It was perfect. Great view from the Cliffside Cabin. Very quiet and peaceful. Will go back again. Feels like home. Comfortable. Only thing needed was iron and ironing board. Amy and Art are great! We enjoyed meeting them. We have been coming to White River Cabins for 17 years. The new owners have made very good progress in upgrading the property. Everyone should make this a vacation spot.